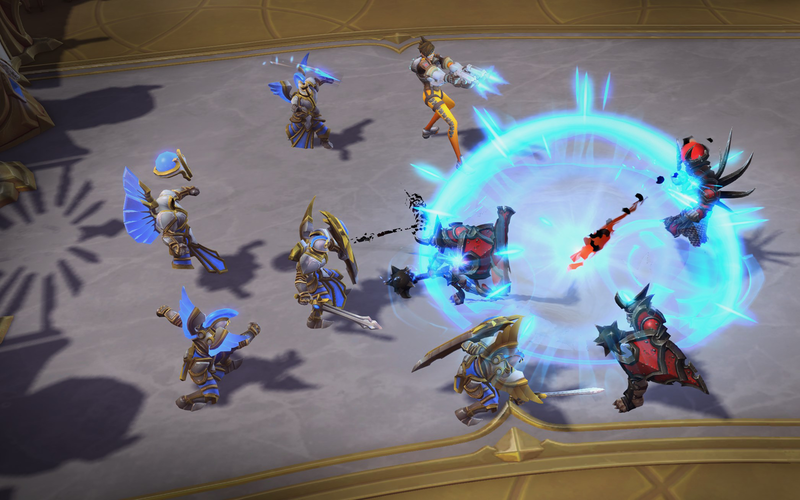 You often hear a lot about MMR Hell in Heroes of the Storm. Players who - presumably - believe their skill level is much greater than where they’re currently ranked, and they’re stuck in rank as a product of others around them, rather than of their own doing. I’ve always partially sympathised as I found myself, when I first joined Heroes of the Storm, struggling to climb the ladder. At the time I thought I was good at the game but it turns out I was pretty terrible and I rightly belonged down in the doldrums. 2000 ranked matches later and many hundreds hours of Quick Match, I now find myself a totally different player and one that is still learning. In recent weeks I’ve had a rocky time in Heroes of the Storm, so much so that I’ve lost over 10 ranks and am now back at rank 10. It’s a huge drop and one that happened quickly and within the space of a couple of days. Partly my fault as a result of being “tilted” after repeated losses but also squarely at the feet of others: I'm in MMR Hell. For the last few days, I’ve continually yo-yo’d ranks, going up and down but never breaking past Rank 10. Every two wins will follow two losses, or a winning streak of more than 3 quickly results in the games being erased by a series of matches that are littered with player errors. While I’m not perfect, I’ve reached the point where my deaths are minimal (around 2 to 3) and my statistics at the end of a match tend to be the highest (certainly Hero damage). Seemingly allowing one of the strongest Heroes in the game to be freely picked is a common occurence. Artanis went AFK within the first ten seconds, disconnected and never returned. Our “bot” Artanis died throughout with our Jaina then going AFK. Our Abathur went AFK (for real) from the start because he didn’t get to play Li Ming (someone on our team banned her). Diablo refused to help the team and instead stayed in the top lane for the entire match (on Dragonshire). He wouldn’t ever venture anywhere else, resulting in him constantly being ganked. Our “Tank” player chose Chen when the enemy team had drafted Muradin and Uther. He also proceeded to 1 v 5 the enemy team at every opportunity, dying repeatedly as often as possible. Our Illidan died 15 times by 1 v 5ing the enemy team, repeatedly. He achieved 15 deaths before 15 minutes had even passed in the game. Needless to say we never had him once during any team fight. Lunara went AFK after 3 minutes and then dropped connection. She preceded to be a free kill for the enemy team during every objective fight (Infernal Shrine). It also didn’t help that our Chen was also AFK. Our Kael’thas alongside three of our team decided to walk into melee range of the enemy Punisher and die instantly (despite all 4 being ranged). The enemy team pushed onto Core within 15 seconds and won the match even though we were winning throughout. Our Nazeebo refused to leave the bottom lane, despite the map being Cursed Hollow. Asked why, he said he didn’t know what else to do (he was Rank 10). Our Lili refused to do anything other than stay in her lane. No matter the objective (Cursed Hollow again) she would do nothing but lane. Fighting over a Curse doesn’t tend to go well 4 v 5 without a healer. Our Greymane wouldn’t ever transform into Worgen form (I seem to encounter this a lot lately) and simply spent the entire match firing his pistol. The problem is, this is literally just 10 of many dozens of matches that have all gone the same way, almost back to back. The Russian roulette of Hero League at this point is undeniable and while I’m well aware that people get to Rank 1 (we’ve all been there and done that) the game is at the stage where if you’ve joined late, it’s a miserable experience to climb and participate in its ranked system. Going back to Rank 10 makes me feel truly sorry for anyone attempting to work their way through Hero League because the level of play and the calibre of player is truly dire. Even now, writing this article, a quick match in Hero League resulted in another loss. Why? Our team felt it wise to not only ignore the Ban system but then proceed to pick Heroes that are free food to every Hero on the enemy team. To make matters worse, two of our team felt a great urgency to regularly and repeatedly run into the enemy team of 5 as often as humanly possible. There’s no amount of experience I can bring to remedy this situation. Such stupid behaviour - and it is stupid - cannot be undone by instructing players to take camps, or informing them to soak or play “safe”. It just doesn’t compute and as far as they’re concerned, they’re playing well and everyone else is bad. Heck, the Illidan had the audacity to report me simply because I asked him not to be so reckless (he’d died 5 times within 5 minutes, at this point). So yes, there is an MMR Hell and I’m back in it. I’m not even sure if I can be bothered to try to wrestle my way out, especially when even the simplest of tasks such as drafting effectively (why would you ever pick The Butcher after the enemy team has picked Brightwing AND Tracer?) seems to be lost on the majority. What frustrates and baffles me the most however is that these players are rank 10 to 15. They should have had their fair share of matches and should - one assumes - know at least the basics of what the game entails. Maybe I'm just asking for too much.